KIEV, Ukraine -- Cristian Jereghi is a Russian citizen. For a few more days, at any rate. A born and bred Muscovite, he is about to receive Ukrainian citizenship as a reward for fighting pro-Russian separatists in the county's east. 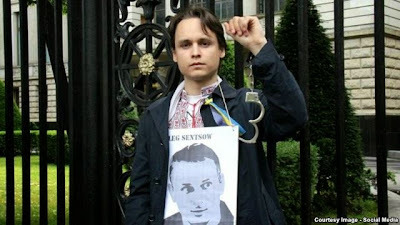 Christian Jereghi demonstrates with a picture of Oleh Sentsov, a filmmaker from Crimea detained in Moscow. Jereghi, 25, says he decided to break ties with his native country after witnessing firsthand what he describes as Russia's aggressive actions in Ukraine. "I'm renouncing my Russian citizenship," he says. "I will send my passport back to the Russian Consulate in a pretty envelope." While a number of Russian citizens are known to have joined the insurgency in eastern Ukraine, reports of Russians fighting alongside Ukrainian forces are rare. Jereghi says it's high time for Ukraine to recognize Russian combatants risking their lives to defend the country. Jereghi has no Ukrainian roots. His mother is an ethnic Russian and his father, Valery Jereghi, is a renowned filmmaker of Moldovan extraction. As a budding filmmaker and journalist, Cristian Jereghi had been working in Ukraine for some time when the Euromaidan protests erupted in Kiev in November 2013. He quickly found his way to the barricades, where he ended up passionately embracing the demonstrators' aspirations to bring their country closer to Europe, away from Moscow's orbit. After spending several months at the Maidan protest camp, he traveled to Crimea to film the Russian takeover of the peninsula, and later enrolled in a battalion fighting separatist rebels in eastern Ukraine. "I feel part of Ukraine now," he says. "I feel much closer to this country, to this society, to these people, than to any other." Jereghi is now back in Kiev, where he is producing documentary films focusing on the rehabilitation of Ukrainian soldiers who fought in the east. He is determined to steer clear of Russia as long as President Vladimir Putin is in power. Russia, he says, is "no longer safe" for him. His father has come to terms with his decision. His new life in Ukraine, however, sits ill with his Russian mother. "She was born in Russia and spent her whole life there, she's a Muscovite through and through," he says. "Unfortunately there were difficult moments when she fully supported the insurgency. We stopped talking to each other for a time because I didn't want to clash with her. She genuinely believes the lies she hears on television." Beyond its symbolic dimension, Jereghi says his passport change will also considerably ease his life in Ukraine. Russian citizens who are fighting, or have fought, for Ukraine face a serious legal quandary. Most have long overstayed the 90 days they are legally allowed to spend in Ukraine without a residency permit. Additional restrictions introduced last year bar Russian citizens from staying more than 90 days in the country within a six-month period. Jereghi estimates there are currently "a couple hundred" Russian nationals fighting on the Ukrainian side. As foreigners, they cannot enroll in the Ukrainian Army and are forced to unofficially fight in volunteer battalions, meaning they and their families are ineligible for any material assistance from the Ukrainian authorities. "They are in a terribly difficult legal situation," Jereghi says. "They can't leave Ukraine, they can't legally extend their stay because the law is not on their side, and they can't go back to Russia, either, otherwise they will immediately be arrested. They are in limbo." In December, Ukrainian President Petro Poroshenko pledged to grant Ukrainian citizenship to all foreigners helping the country battle insurgents in the east. In practice, however, things are not as simple. Ukrainian law prevents foreigners from applying for Ukrainian citizenship if they are found to have breached the 90-day residency rules. Due to their unofficial status, most foreign combatants are also unable to provide formal evidence they fought for Ukraine. Their frustration deepened this month after Ukrainian officials failed to acknowledge the death of a Georgian fighter killed in a firefight with rebels on April 19 in the eastern Ukrainian town of Shyrokyne. During a briefing with journalists the following day, government spokesman Andriy Lysenko simply said that "no Ukrainian forces" had died in the battle. Jereghi himself spent two months collecting documents for his citizenship application, a process that typically lasts one year. He was granted a positive answer only after personally appealing to Poroshenko in an emotional post on Facebook. 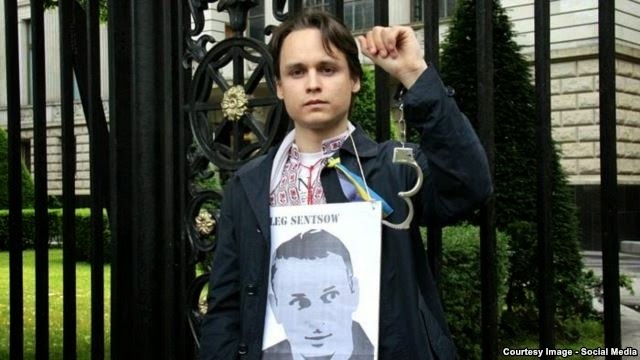 "Dear Mr. President, I ask for Ukrainian citizenship," he wrote on February 19, his 25th birthday. "I don't want to die defending this country with a Russian passport in my pocket." The next day, he received a call from the president's office telling him his application would be handled as quickly as possible. A bill aimed at speeding up the naturalization process for foreign fighters has since been introduced into the Verkhovna Rada, Ukraine's parliament, which passed it in a first reading last week. Jereghi hopes the new measures will provide much-needed relief to all foreigners, particularly Russians, battling to stamp out the insurgency in eastern Ukraine. "You can imagine what it's like to be on the front line as a citizen of the country that Ukraine is fighting," he says.